Ingrid’s newest work, Queen of Masquerade is unique in many ways, even for her. In it she experiments with new materials to give a different illusion of depth and dimension. 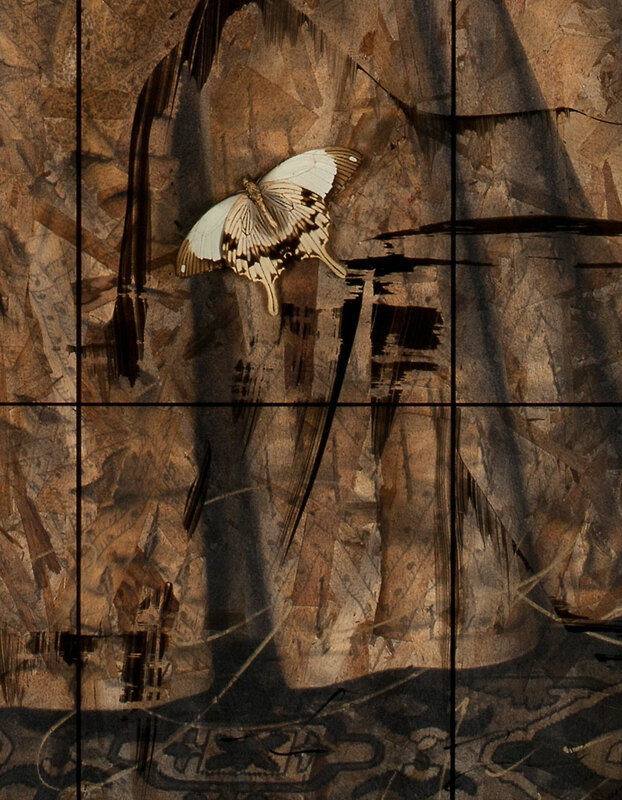 Masquerade, along with several other new works are made with acrylic, wood, butterflies and objects. Unlike her traditional work, the image is not transparent, but sits as the furthermost layer. The other objects sit in front of it, solid and weighty. The closest layer to the viewer is clear acrylic (Plexiglas) drawn with a fine grid, and a hint of misty paint. That’s the structure of the work. Let’s look inside and at some of the symbolism set there. 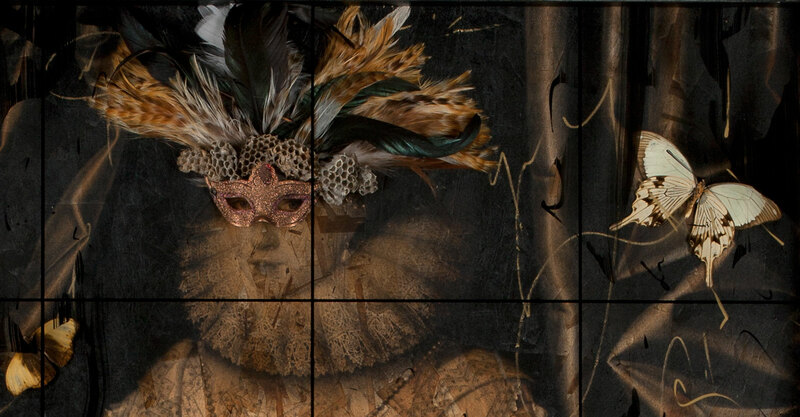 At first look, one sees the overall form of Countess Cecil, her mask against the dark background. Masquerade has a somber ghost-like quality that speaks of time, history, perhaps an ancient ball that the countess might have attended. Its monochromatic theme is only slightly broken by the bright flowers and butterflies. Even with the splashes of color, darkness pervades the piece. One might be tempted to stop here, interested enough in the overall mood and feeling of the piece. It is hauntingly beautiful in its entirety, but let’s move in for a closer look. As with all portraits, we are drawn to the subject’s eyes. In this case, peeking through the ballroom mask, we find Countess Cecil’s haunting eyes. Cecil was a very beautiful woman, we can see that now. She was also confident of her beauty as she looks back at us, unafraid. The wasp’s nest which makes up her headdress suggests something of a sting. Gratefully this is softened by the feathers, soft and beautiful. The white butterfly to her left symbolizes life and beauty and the fleeting nature of both. Cecil may have been beautiful, powerful in her day, but she, like all living things, has been recaptured by time. We move our attention down to Cecil’s hands in the center of the artwork. In her right she lightly holds a fan, perhaps suggesting a bit coquetry. 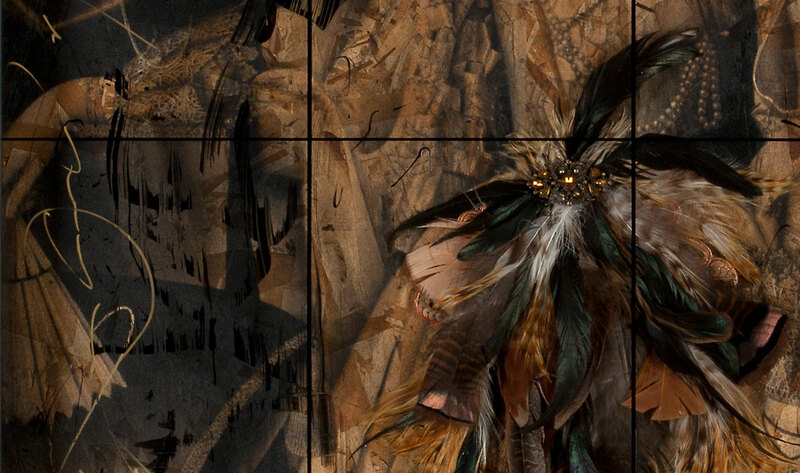 In her left hand a corsage of feathers balances that of the headdress. Cultures across time, countries, even continents are more similar than they are different. This is the same in Masquerade, suggesting that the countess could be African, Asian as easily as European royalty. At the bottom of the art we see the surprising detail and depth which makes this such an interesting work. The white butterfly seems to have landed on Cecil’s dress, which is deeply folded, and dark against the intricate patterns of the rich carpet. We also see a portion of the grid which Ingrid has painted on the surface. It gives us a sense of separation, a kind of window that we are looking through, or Countess Cecil is looking out of. It is a metaphor for time, that which ultimately separates the subject from the viewer. Transparent, but impenetrable. The Queen of Masquerade is an example of how Ingrid continues to experiment with her work, breaking through barriers. A dear friend and artist described this new body of work, as “bold and fearless.” And indeed it is. You can view the rest of Ingrid’s new work on her web site at www.IngridMagidson.com. 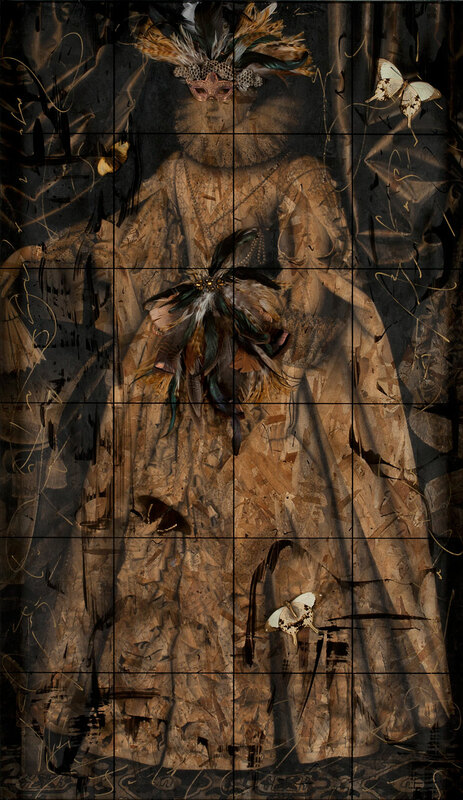 This entry was posted in Art, Layered Mixed Media, Museum, New Work. Bookmark the permalink.